Today, a subject of major importance in fundamental physics is the investigation of the origin of Electroweak Symmetry Breaking. The Tevatron Collider in Chicago is actively searching for the Higgs boson. The largest collider, LHC (Large Hadron Collider) at CERN in Geneva has been working at a centre-of-mass energy of 7 TeV and a luminosity larger than 1032 cm-2 s-1. Probably analysis on the Higgs boson from significant LHC data sets will be presented for the first time this summer at the major international Europhysics Conference on High Energy Physics, which takes place in Grenoble from 22 till 27 July 2011. 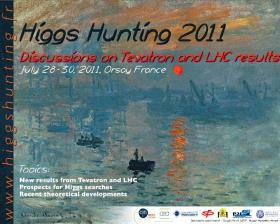 We are organising the 2nd Higgs Hunting workshop as a satellite workshop in Orsay from 28 till 30 July on the subject of "Discussions on Tevatron and LHC results". We will also review the latest Tevatron results, where we expect a major update for the summer 2011 which will be comparable to what the LHC has delivered.